We can measure the immense finesse of the Church in dealing with everything when we consider that the only saint with a special feast for her birthday is Our Lady. We are not considering Christmas, of course. This corresponds to the worship of hyperdulia that the Church reserves for her. The Church reserves the worship of latria, or adoration, only for God - for Our Lord Jesus Christ, therefore, Who is the Word Incarnate. The worship of dulia, or veneration, the Church assigns to the saints. But to Our Lady she has a worship that is neither the simple worship of dulia nor the supreme worship of latria, but rather the worship of hyperdulia, which is a higher veneration unparallel to any other. So, we have a feast celebrating the birthday of the Holy Virgin, one of the many feasts the Church reserves for her. Analogously, because of her singular virtue, the Church permits that a church can have more than one statue of Our Lady at the same altar, a rule that does not apply to any other saint. In this way she makes it understood that Our Lady is beyond comparison with any other creature. It is a liturgical way to teach the theological truth that she is the Mother of God. The feast day of the nativity of Our Lady induces us to ask: What advantage did her birth bring for mankind? And why should mankind celebrate her nativity in a special way? In the order of nature, Our Lady was conceived without original sin, giving her a singular and peerless value. She was a lily of an incomparable purity and beauty that appeared in the night of this land of exile. She also had all the natural psychological gifts that a woman can have. God gave her the richest personality imaginable. To this, He added gifts of the supernatural order, the treasures of graces that were hers. She received the most precious graces God ever gave to any human creature. Given that she was without original sin, she had the entire use of reason from the moment she was conceived. Therefore, already in the maternal womb, Our Lady had very elevated thoughts. 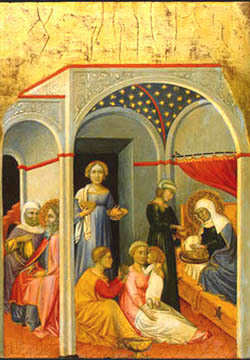 The womb of St. Anne was for her a kind of temple. There she was already interceding for the human race and had begun to pray – with the highest wisdom that was a gift from God – for the coming of the Messiah. In reality she was influencing the destiny of mankind as a source of graces. Scripture tells us that the tunic that Our Lord wore was a source of grace that cured those who touched it; this being the case, you can imagine how Our Lady, the Mother of the Savior, was a source of graces for whosoever would approach her, even before she was born. For this reason we can say that at her nativity, immense graces began to shine for mankind and the Devil started to be smashed. He perceived that his scepter had been cracked and would never be the same again. At the time of her birth, the world was laid groveling in the most radical Paganism. Vices prevailed, idolatry dominated everything, abomination had penetrated the Jewish religion itself, which was a presage of the Catholic Religion. The victory of evil and the Devil seemed almost complete. But at a certain moment God in His mercy decreed that Our Lady should be born. This was the equivalent of the beginning of the destruction of the reign of the Devil. Our Lady was so important that her birthday marks a new era in the Old Covenant. The History of the Old Covenant was a long wait for the coming of the Messiah. After the original sin of our first parents, mankind had to wait 3,000 years, perhaps more, for the Messiah. But at a certain blessed moment, Divine Providence decreed that a woman should be born who would deserve the coming of the Messiah. Her nativity represents the entrance into the world of the perfect creature who found grace before God and had merit sufficient to end that extensive wait. All the prayers, sufferings, and faithfulness of the just men living and dead reached their apex with her arrival. There had been Patriarchs, Prophets, just men among the Chosen People and certainly some just men among the Gentiles who had prayed, suffered, and waited; none of this was sufficient to attract the coming of the Redemption. But when God so willed it, He made the perfect creature be born to be the Mother of the Savior. Therefore, the entrance of this exquisite creature into the world marks the presage of the Redemption. The relationship between God and man began to change, and the gates of Heaven that had been tightly locked were semi-opened, permitting the light and breeze of hope to pass through. Her birth represents the entrance into the world of a new grace, a new blessing, a new presence that was an incomparable presage of the presence, blessing and grace that would come with the Savior. For all these reasons the Feast of the Nativity of Our Lady should be most dear to us. It is the event that announces the fall of Paganism. 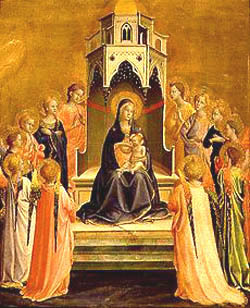 Since we are sons of Our Lady not by our own merit but by her choice, on this day we can ask of her a special grace. Many mystics who had visions of Our Lady said that on her feast days she visits Purgatory to release a great number of souls whom she takes back with her to Heaven. What happens with the Church Suffering gives us an idea of what takes place with the Church Militant. On these feast days her grace envelops us and gains innumerable favors for us. I suggest that on her nativity each one of us ask her the graces that we need. But I also suggest that as counter-revolutionaries, we ask her to give us a love and ardent desire for the Reign of Mary similar to the desire she had for the Messiah. A wise and reflective desire that cleanses our souls of any attachment to this revolutionary world and allows us to be her tools for the destruction of the Revolution and implantation of her Reign.